Check the blog/news. Feel free to poke us via the contact form if it has been a while. We’ve had a variety of costume shops we have worked with over the last decade. Sadly, most are not in business anymore. We’d love to order some more copies and sizes. Does Project Super Woman do custom videos? We have yet to do one mostly because we don’t want to commit to a turn around time and disappoint you. However, we have considered it from time to time. If you have a story idea you want to share or are willing to help us with resources, please contact us. This is a labor of love and creative outlet done by a fan and I want improve. How are videos and photos delivered? Instant Download. Our new shopping cart redirects you to download links right after you pay. Links are also e-mailed. No problem. 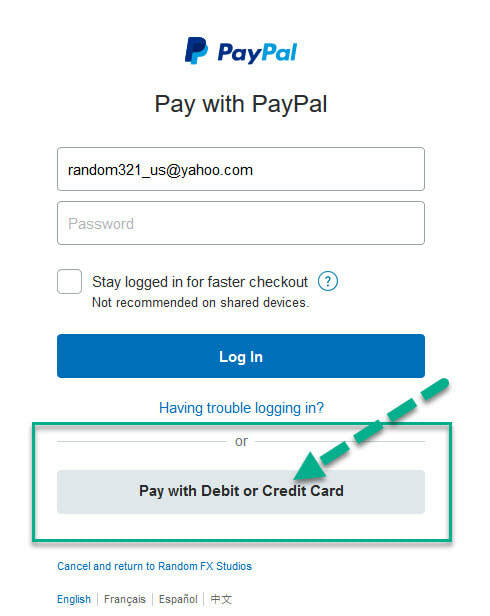 When you hit the payment information stage look for the “or pay with debit or credit card” button. See the image on the right. Do I have to give my phone number? No. Only name and e-mail address are required on the “personal information” page skip the phone number. Do I have to give my address? No. You will have to give your billing address if using a credit card. We don’t ever see that. You should be able to leave the shipping address blank (or put in something fake). What video format do you use? All videos and photo stories are downloaded as a zip file. Our newer videos are MPEG 1080p. Our older videos are .AVI file using the DIVX codec (those are either 480i or 1080p). Did we miss something or do you have a detailed comment or question? Please contact us!